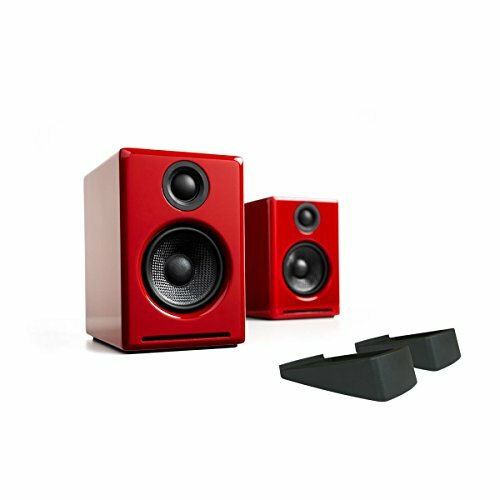 The award-winning Audioengine 2 speakers just got better. With a built-in digital-to-analog converter (DAC), the Audioengine 2+ allows you to send high-quality digital audio direct from your computer's USB port. We've also added an output to connect a subwoofer and you can even go wireless with the optional Audioengine W3 adapter. The Audioengine 2+ is a great introduction to high-quality audio and the perfect upgrade for your computer or iDevice. Elevate Your Audio - The Audioengine DS1 Desktop Stands were designed to make the best of a desktop setting by first and foremost aiming the speakers higher. This brings the tweeters closer to ear level, and reinforces the frequencies that make up your music's sound stage. The DS1 Desktop Stands work best with smaller speakers like the A2+s. The A2+ was designed for your desktop but their superb soundstage and imaging also makes them the perfect choice for across the room. Well-suited for all your music, movies and games, the A2+ sounds great with or without a subwoofer. The A2+ features analog amplifiers that are built into the left speaker, while the right speaker is passive so setup is simple. Just plug the left speaker into AC power and connect the included speaker wire from left to right. Audioengine uses audiophile quality, ferro fluid cooled, silk dome tweeters with neodymium magnets. Silk tweeters hold up well under high power and the edge-driven design gives very smooth response. The custom woofers are Kevlar woven glass aramid composite with rubber surrounds.